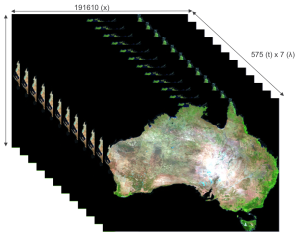 Geoscience Australia is testing a new system for analysing and visualising massive datasets linked to stacks of ‘time slice’ Landsat images. The Australian Geoscience Space-Time Data Cube was promoted at a recent European Earth observation strategy workshop as ‘a new paradigm for managing and using environmental data’. The Time-Space Data Cube system for crunching Landsat images over more than a decade. Geoscience Australia. 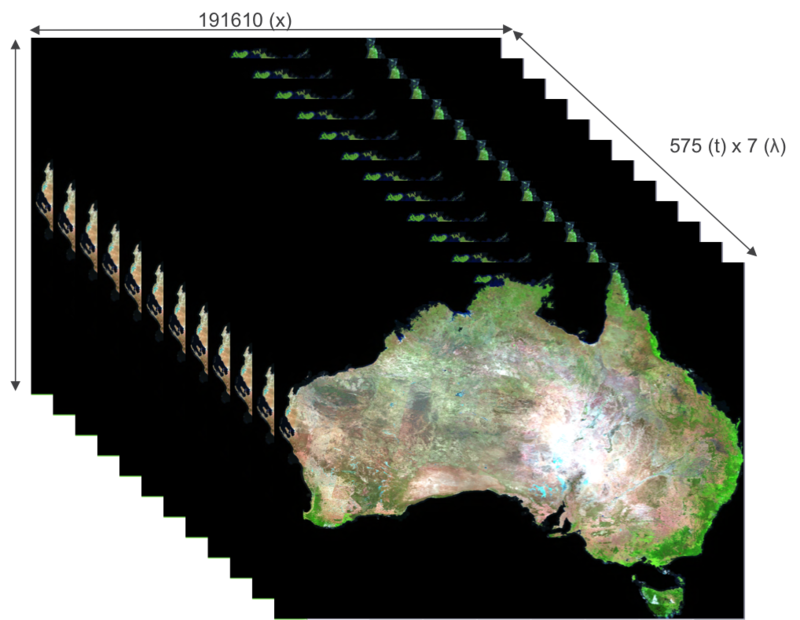 The concept is to ‘cube’ datasets by stacking Landsat image ’tiles’ in time sequences covering the same area of ground. It’s like a geographic version of the Time Machine desktop image stacks used for visualising data backups on Apple Macintosh computers. Dr Adam Lewis, Leader of GA’s National Earth Observation Group, said the Data Cube prototype has been evolving since early 2013 and so far contains 15 years of Landsat 5 and 7 imagery. 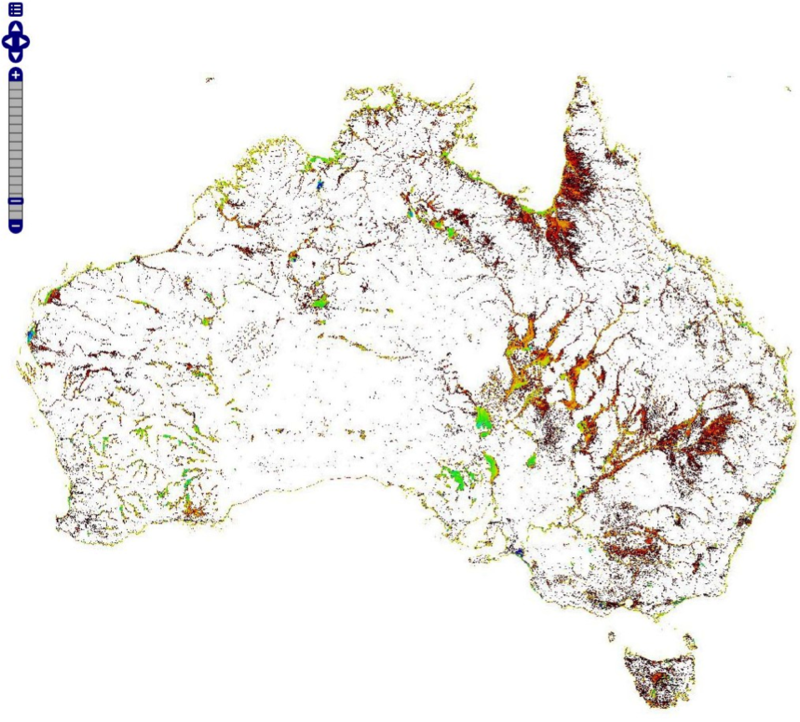 The dataset covers Australia’s total land area with 3,960,528 tiles using 110TB of compressed geoTIFF files. The Data Cube is hosted on the National Computational Infrastructure (Raijin supercomputer) at the Australian National University. Said Lewis: ‘The Raijin high performance computing facility – 1.2 petaflops – is a critical enabler of the Data Cube system. For example, it’s now possible to do a time series analysis of 15 years of Landsat data for surface water, across the whole continent, in under two days of processing time’. GA technicians access the Data Cube via a Python API which can generate specific mosaics and stacks of image tiles. GA expects users could apply their own algorithms via the API to ‘interrogate’ the data. Geoscience Australia’s continental surface water map, using time series images from Landsat 5 and 7.